While aging is a natural process that cannot be avoided, there are many different ways for respite caregivers in Oshkosh to keep their senior loved ones healthy for as long as possible. By considering a few factors, family members can significantly boost the lifespan of an aging adult. Seniors should have medical checkups on a regular basis. Getting routine checkups can help detect problems before they become serious or life threatening. 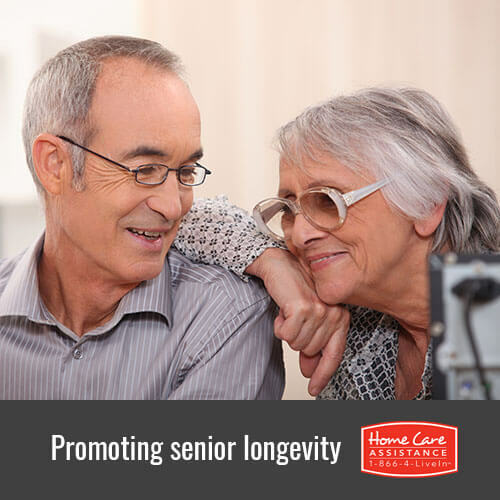 Seniors taking cardiovascular medications require more frequent monitoring and laboratory tests to ensure that their prescription medications are providing the desired effect. A diet consisting of mainly lean meats, fruits, vegetables and low-fat dairy products provide the necessary nutrients for seniors while minimizing the chance of gaining excess weight. Many seniors also benefit from taking calcium and vitamin supplements to boost their nutritional intake for bone, blood, and muscle health. Dementia caregivers in Oshkosh might encourage seniors to work on crosswords or jigsaw puzzles, play scrabble or take part in other games that require analytical thinking or strategy skills. These activities keep the brain stimulated, delay the onset of dementia and cognitive disorders, and enhance self-esteem and emotional health. A consistent exercise regimen offers cardiovascular, mental and emotional health benefits for seniors. Family members can work with seniors to stay physically active by inviting a loved one to go for a walk, take a yoga class and maintain a flower or vegetable garden. Many retirement communities also offer water aerobic classes that provide the chance to improve balance and muscle endurance without posing a risk of injury to weight bearing joints. Belonging to a community, having a network of friends and visiting with family members are all opportunities for seniors to have an active social life. Being socially active provides seniors with the chance to stay up to date on current events and fortify bonds with loved ones while bolstering their self-esteem and sense of belonging. You can also boost your loved one’s longevity with help from Oshkosh, WI, home care agencies like Home Care Assistance. Our in-home care enables seniors to live independently while getting the help they need with daily exercise, meal preparation, and transportation to and from medical appointments. Call a friendly Care Manager at 920-710-CARE (2273) today to learn how our services can help your loved one age in place with dignity.